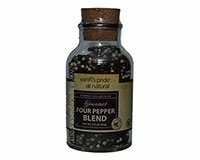 Olde Thompson blends four peppercorns into one mix for this seasoning. Contains White Pepper, Black Pepper, Green Peppercorns, and Pink Peppercorns. Visually striking at the dinner table when placed in a clear grinder. Ingredients: Malabar Black Pepper, Muntok White Pepper, Green Pepper, Pink Pepper.